On Thursday, Linus Ullmark, an up-and-coming goalie with the Sabres’ AHL affiliate Rochester Amerks was named to the American Hockey League’s North Division roster for the 2018 AHL All-Star Classic. It’s his second consecutive All-Star selection. Last year, he had a sparkling 15-save performance in the Skills Competition, earning him Top Goaltender honors. The two-day event will take place Jan. 28-29 at the Adirondack Bank Center at the Utica Memorial Auditorium in N.Y., home of the Utica Comets. The 24-year-old Swede has been a workhorse for the Amerks this season. He ranks second in the AHL in saves (668) and minutes played (1,362) while being tied for first in wins (15) and shutouts (2). The 6-foot-4, 212-pound netminder has an impressive 15-5-3 record. He’s won 14 of his last 20 starts, including rattling off a career-best five straight wins in November. He’s especially good on the road, with a 7-0-3 record this season. The Amerks’ reigning MVP ranks third among all AHL goalies with a .926 save percentage and fifth with a 2.33 goals-against average. He was named the AHL Player of the Week for the period ending Dec. 24, 2017. The Sabres’ 2012 sixth-round pick (163rd overall) is in his third season in Rochester. In the AHL, he has a career record of 51-48-5 with a 2.89 goals-against average, a .911 save percentage and three shutouts. Last year, he played even better than his stats indicated. He appeared in a career-high 55 games to lead all AHL goalies and established personal and career-highs in saves (1,525), shots-against (1,678) and minutes played (3,201), all of which led netminders in the league. He was named the Amerk’s Team MVP, Most Popular Player and was the recipient of the Fairand/O’Neil Sportsmanship Award. Ullmark has played 21 games for the parent club, with an 8-11-2 record, a 2.64 goals-against average and a .913 save percentage. All but one of those games were in the 2015-16 season. His only appearance for the Sabres in 2016-17 was a 33-save performance in a 4-2 loss to the Tampa Bay Lightning. These were pretty solid numbers considering the team was not that successful. After the season, then general manager Tim Murray spoke highly of him and made it clear that he has a bright future with the organization. Murray was sent packing after the 2016-17 season ended. 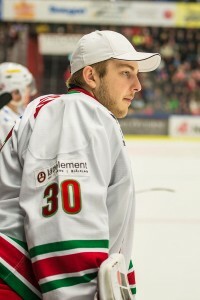 Before crossing the pond in 2015, Ullmark played for MODO Hockey of the Swedish Hockey League. He posted a 10-18-4 record with a 3.12 goals-against average and a .904 save percentage in 35 games. He finished sixth among goaltenders in saves (950), eighth in games played and tied for 16th in wins (10). In 2013-14, Ullmark won the Honken Trophy as Sweden’s Goaltender of the Year (similar to the NHL’s Vezina Trophy). It’s the same award Henrik Lundqvist won three straight seasons from 2003-05. Ullmark had the league’s best save percentage (.931) and ranked seventh in goals-against average (2.08) while setting career-bests in minutes played (2,043), wins (14), saves (964), shutouts (3). 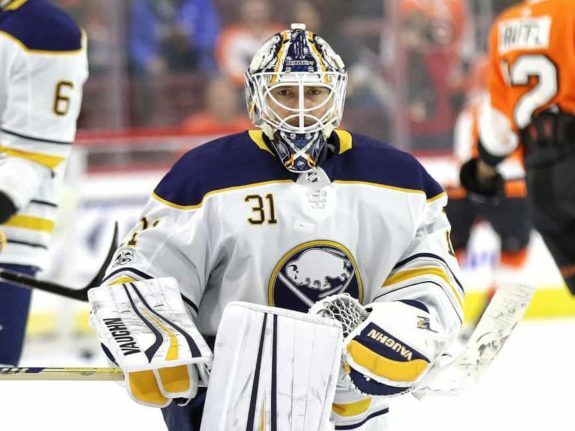 TSN’s Darren Dreger has reported that teams have called the Sabres about both of their current netminders, Chad Johnson and Robin Lehner. Teams needing some reinforcement in the crease are fishing to find out what it takes to pry one of them away. Barring a major miracle, the Sabres’ year is basically over. Despite half of the season remaining, they’re all but mathematically eliminated from the playoffs. The team’s postseason drought will extend to seven years. Per Elliotte Friedman of SportsNet, the Sabres are open to listening to offers on anyone except Jack Eichel. That surely includes both of their netminders. 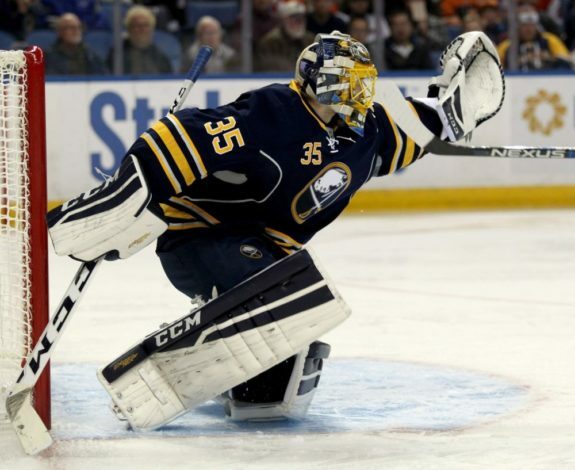 Lehner, 26, will be a restricted free agent, while Johnson, 31, will be an unrestricted free agent this summer. Lehner has a neon-badge of disapproval from outspoken fans after being acquired at the 2015 draft by former general manager Tim Murray in exchange for a first-round pick. Lehner has been hung out to dry countless times per night. His 2.75 goals-against average and .916 save percentage don’t do justice to his ability to keep his team in games. He’s performed admirably while the team in front of him has not. The roster is woefully underachieving and lacks physicality, especially the slow-footed defensemen. It’ll be up to Jason Botterill to determine if Lehner will be the starter in the future. Since Lehner’s contract ends after this season and he’s on a bargain-priced $4 million deal, it’ll be relatively easy to move him. Several teams, including the Florida Panthers and Pittsburgh Penguins, could use some shoring up in goal. It’s highly unlikely Lehner’s value would return the first-round draft pick it took to get him but if Botts doesn’t see him as part of the team’s solution, he should be dealt. Johnson was brought in on a one-year deal to be the backup and hasn’t won any fans in return. This year, he’s started 11 games, with a 1-6-3 record. That’s one win in ten games, with a 3.78 goals-against average and a .881 save percentage. Ugly. In 2015-16 he had some success with the Sabres, posting a 2.36 goals-against average and a .920 save percentage in 46 games–the most he’s ever played in a single year. The team in front of him has been sub-par, yet they love him in the locker room. Johnson signed a one-year deal with the Calgary Flames last year as a co-starter, but his numbers trailed off a bit. He’s spent parts of eight seasons with six different NHL teams, the definition of a journeyman goalie. Trading Johnson would likely be easier than Lehner since he’s a backup with a very manageable $2.5 million contract. Just yesterday, the Montreal Canadiens sent Al Montoya to the Edmonton Oilers for a fourth-round pick. 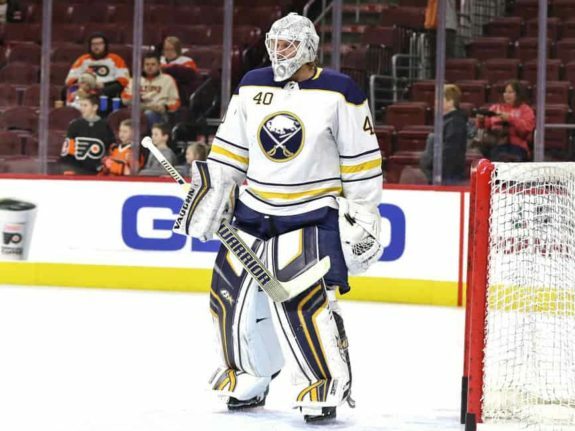 Should one of the Sabres’ goalies get traded this season, which seems inevitable, Ullmark may not be the obvious choice to be brought up. The Amerks are playing great hockey and hope for a deep playoff run. Ullmark would benefit from playing big minutes and being around a winning culture. Ullmark’s backup in Rochester is Adam Wilcox. The 25-year-old has a 5-3-2 record in 13 games played, with a 2.88 goals-against average and .903 save percentage. The Sabres signed the unrestricted free agent last summer to a one-year, two-way NHL deal. Last year, he appeared in a career-high 47 games for the Syracuse Crunch (Tampa Bay Lightning) and Springfield Thunderbirds (Florida Panthers). He set career bests, with a 25-13-2 record, a 2.63 goals-against average, a .906 save percentage and four shutouts. Deeper in the pipeline are a pair of 6-foot-4 goalies, 22-year-old Swede Jonas Johansson (drafted 2014, third round, 61st overall) and 25-year-old Canadian Jason Kasdorf (drafted 2011, sixth round, 157th overall by Winnipeg). Kasdorf came to the Sabres in the Evander Kane-Tyler Myers trade in 2015. Both are currently playing for the Cincinnati Cyclones of the ECHL. Ullmark, a left-handed catching goalie signed his second contract with the Sabres in June 2017. His two-year deal earns him $750,000 annually. He’ll be a restricted free agent when his contract is up. 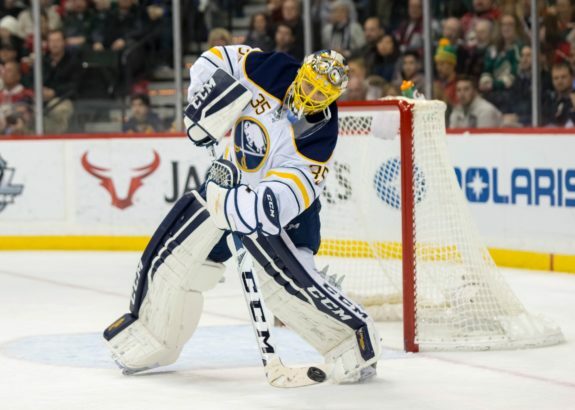 Given many fans’ dislike for Lehner, deservedly or not, and the fact that he’s on a one-year deal, there’s a pervasive thought that Linus will be wearing blue and gold next season. It is possible. The big Swede’s time will come with the Sabres as he continues to impress and succeed in Rochester. He’s proven himself and has waited patiently for another chance in the big league. He is a conservative, yet athletic, reactionary-type goalie with very good rebound control. He plays a strong positional style most closely linked to the modern battle-fly and deals well under pressure, rarely getting rattled. His composure and poise are improving every season. Ullmark deserves a shot. But when that happens is still up in the air. And for those assuming he’ll immediately succeed in Buffalo, it’s never a sure thing for any player, let alone a young goalie. Even then, goaltending is the least of this team’s concerns.